The Colorado Columbine Chapter of American Needlepoint Guild has a full calendar of spring needlepoint projects from which to choose. Choose one or choose all! There are chapter projects and pilot classes (where teachers try out new designs on volunteer stitchers) and even a party on tap! Marcia G. with a Terry Dryden piece. Our very special member of long standing, Marcia G., has a birthday coming up and we would like to celebrate it with her. Our February meeting, on TUESDAY, the 16th (a change from our usual day of the week) will be a party in her honor. Marcia is an extraordinary stitcher, prolific, schooled and talented and we are going to be treated to an exhibit of her most fun projects. What an honor to have such a busy stitcher with us! 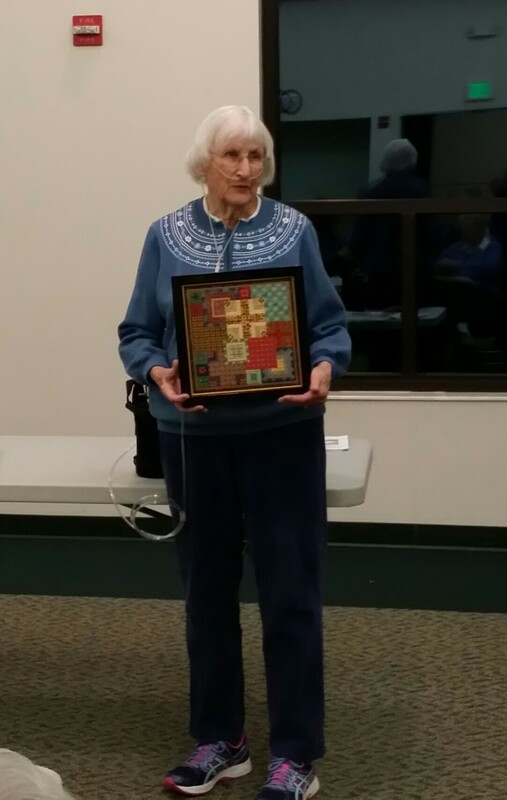 Here, she shows a finished Terry Dryden piece, ‘Mediterranean Squares,’ at the last meeting, which Marcia says she enjoyed stitching. Also coming up in February, the nominating committee will present a slate of potential officers and take further nominations from the floor to fill jobs coming open in the spring: President, 1st Vice President (Programs) and Secretary. Volunteers are always welcome and indeed, absolutely necessary to the functioning of the chapter, so hands up if you can assist! Sign ups began in January for the Crazy Quilt Egg design by Rainbow Gallery. The last chance to get in on this is the February 16 meeting, so sign up by then for this class project which will be taught in Fellowship Hall at Bethany Lutheran on March 21. In February, we meet on TUESDAY, the 16th!!!!!!!!!! !